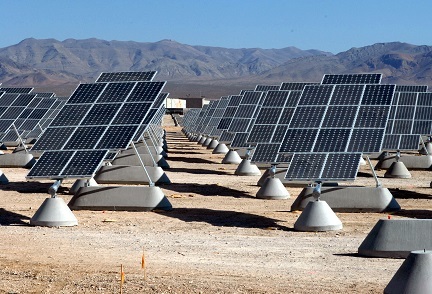 Solar energy is energy from the sun. It originates from nuclear fusion taking place inside the core of the sun. The fusion occurs due to the great internal pressure inside the sun. This pressure fuses hydrogen atoms into helium atoms and releases a large amount of energy in the process. The sun is an enormous source of energy and is responsible for sustaining all life on earth. It has more than enough energy to satisfy all our world energy needs, now and into the very distant future. The sun radiates energy towards the earth in the form of electromagnetic radiation. This radiation heats all objects that it touches. 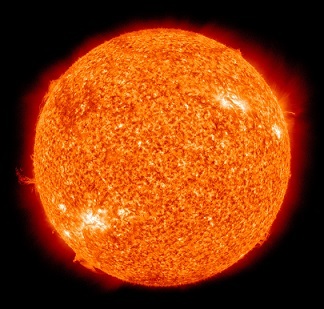 You can think of the earth as just one big object being heated by the sun's radiation. The energy generated by the sun can be utilized in several ways. One way is by solar water heating using solar collectors. 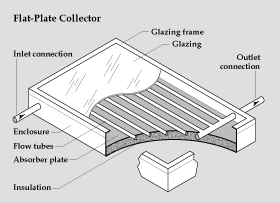 The solar collectors absorb the sun's energy and use that energy to heat water for use in homes and buildings. This reduces the need for a hot water tank. By heating water using the sun's energy, less energy is needed for hot water tanks (which normally use gas or electricity to heat water). This saves money. Normally in solar water heating, water is pre-heated using the sun's energy and then pumped into hot water tanks. This pre-heated water, as a result, does not need to be heated as much by the water heater, which means less gas or electricity is needed. 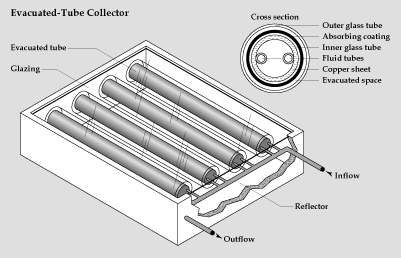 The figures below show schematics for solar collectors. Another way to utilize the sun's energy is by using many mirrors to focus sunlight towards a central receiver in order to concentrate the sun's energy. Since the sun moves across the sky, the mirrors must constantly adjust their orientation to keep the sun's reflection focused onto the central receiver. The mirrors adjust their orientation using a special mechanism which tracks, and adjusts for, the movement of the sun across the sky. As a result of this focused sunlight the receiver becomes very hot and the heat energy at this receiver is then used to generate electricity. For example, the picture below shows a power tower. The temperature at the central receiver can be over 500 degrees Celsius. The heat energy at this receiver is used to heat water and produce high-pressure steam. This high-pressure steam is used to run large turbines which generate electricity for use in homes and buildings. Another similar way to utilize the sun's energy is with Stirling engine dishes. A Stirling engine dish is shown below. The Stirling engine (labelled as the Power Conversion Unit) only needs a high temperature heat source to run. 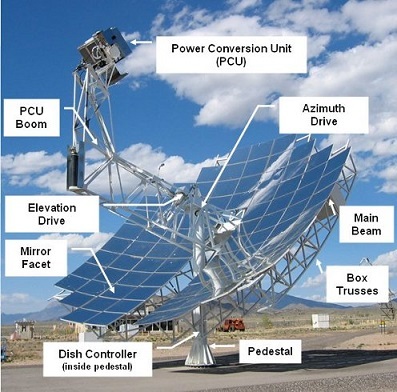 A large reflective parabolic dish, made up of many mirrors, is used to focus the sun's energy towards a receiver attached to the Stirling engine. The receiver is located at the focal point of the dish. This is where the sun's energy is focused. The dish must face the sun head on in order for the sun's energy to be focused at the focal point. This requirement is due to the geometry of the parabolic dish. Since the sun moves across the sky, the dish of the Stirling engine constantly adjusts its orientation to keep itself pointed at the sun. This keeps the sun focused onto the receiver. The dish adjusts its orientation using a special mechanism which tracks, and adjusts for, the movement of the sun across the sky. The heat energy at this receiver is then used to run the Stirling engine which runs a generator which produces electricity for use in homes and buildings. The temperature at the receiver can be over 800 degrees Celsius! This is higher than the receiver temperature of the power tower, and as a result, the Stirling engine runs more efficiently and is able to convert more of the sun's energy into electricity. The explanation for this is based upon the principle of Carnot efficiency, which is a well-known thermodynamics concept. Stirling engine dishes are actually the most efficient devices for converting solar energy into electrical energy. Their efficiency is about 30%. 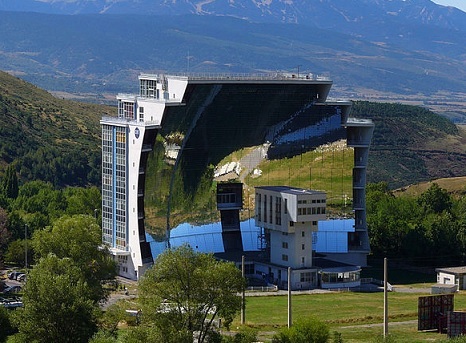 This means that 30% of the incident solar energy hitting the mirrors is converted into electricity. This efficiency is significantly more than the efficiency of all other electricity generating devices that use the sun as an energy source. Unfortunately, the disadvantage of using the sun's energy is that it only works well when it's sunny with no clouds. Once the sun goes behind a cloud the intensity of the sun's radiation is blocked and it loses most of its ability to heat objects and produce electricity. To understand this think of a magnifying glass used to focus the sun's energy. It only works when the sun is shining. When it's cloudy the magnifying glass can no longer focus the sun's energy. This disadvantage can be overcome with energy storage devices which store the sun's energy when the sun is shining for use when it's not shining. An example of these devices are large batteries and pumped storage hydroelectric stations. However, there is a way to produce electricity using the sun's energy even when it's cloudy. And that is with solar panels, shown below. These specially designed panels are made of a photo-sensitive material which converts the sun's light energy into electricity, using what is known as the photovoltaic effect. As mentioned, solar panels also produce electricity when it's cloudy, although not nearly as much as when the sun is shining. When it's cloudy solar panels may produce only 20-30% of the electricity produced when it's sunny. 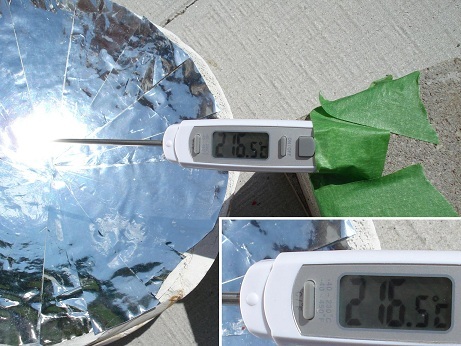 I did a neat solar experiment years ago. I created a parabolic dish to focus the sun's energy. It was a neat experiment to see how much heat energy I can get from the sun. The dish I made is about one foot in diameter and is shown below. 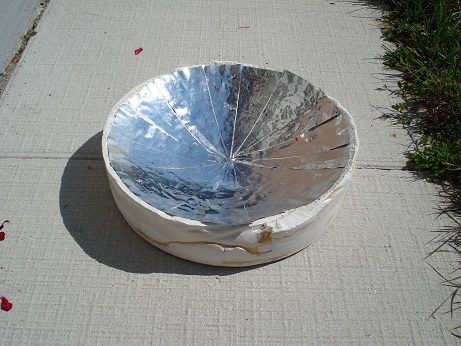 I made the parabolic shape using plaster of paris, and I created the reflective surface (needed to focus the sun's energy) with potato chip bags. I cut up the bags into wedge shapes and glued them, shiny side up, to the parabolic-shaped surface. I didn't use aluminum foil to create the reflective surface because it's easy to crinkle it when gluing it to the parabolic-shaped surface, and this would reduce its reflective ability. Using this dish I was able to focus the sun's energy to a very hot point, which I measured to be 216.5 degrees Celsius using a kitchen temperature probe (shown below). When doing this experiment I was careful not to burn myself, so I taped the temperature probe to a brick and then moved the probe to the focal point of the dish in order to get a steady temperature reading without having to hold the probe. I also wore ultraviolet filtering sunglasses to protect me from the intensity of the sunlight reflecting off the dish. If you try this experiment yourself make sure you take the same precautions! This high temperature I measured is proof of how powerful the sun's energy is, even over the small area of the dish. Now imagine how great the heat intensity is for a much larger dish. In fact, there is such a dish. It is known as a solar furnace. There is a very big one located in France which is capable of producing 3,500 degrees Celsius! That's hot enough to boil steel! A picture of it is shown below.